It is Definitely a Beautiful View! 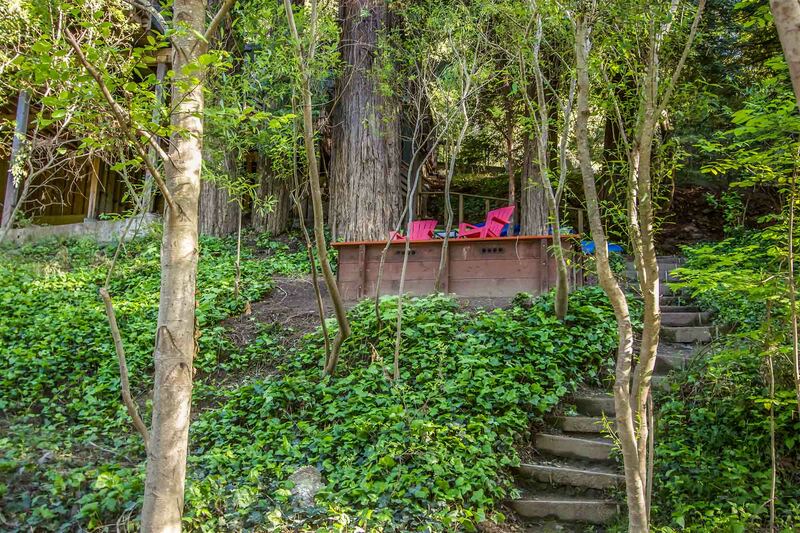 Unusually Private Contemporary Riverfront Home, Redwoods, Riverside Lounging/Dining Decks with Sweeping River Views, *Seasonal River Access & Boats, Hot Tub. Central Heat, Fireplace. Walk/Short Drive to Downtown Guerneville, Johnson’s Beach (1.7 mi, no sidewalks). Short Drive to Wine, Redwoods, Golf, Coast. Wi-Fi, Unlimited Domestic Long Distance, Cable TV. Keyless Entry. Your Well-Behaved Dog is Welcome! Bella Vista’s living room and dining area are open to each other, with the kitchen adjacent to the dining area with a pass-through. On the far side of the living room, the den/3rd bedroom (can be closed off with doors) has a daybed with trundle, a full bath and opens to a privacy fenced patio with hot tub. Upstairs, there are two bedrooms and two full baths. Off the living area, there's a riverfront deck with outdoor dining. 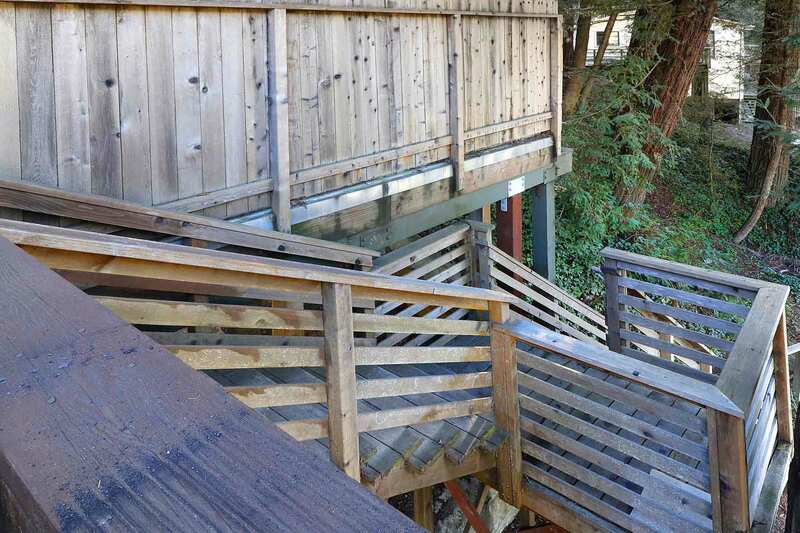 From the deck, stairs lead to *seasonal river access and riverside deck. House is approximately 1296sf. Note steep steps to river. Central Heat, Fireplace (living room). NO A/C. Great place and location for wine tasting. Great place, right on the river, and the hot tub is awesome. "perfect starting point to explore"
You won’t be disappointed! The view was incredible, the house stocked with all the supplies you need, and the perfect starting point to explore the area. We will definitely return! It is a great location, close to town, ocean. 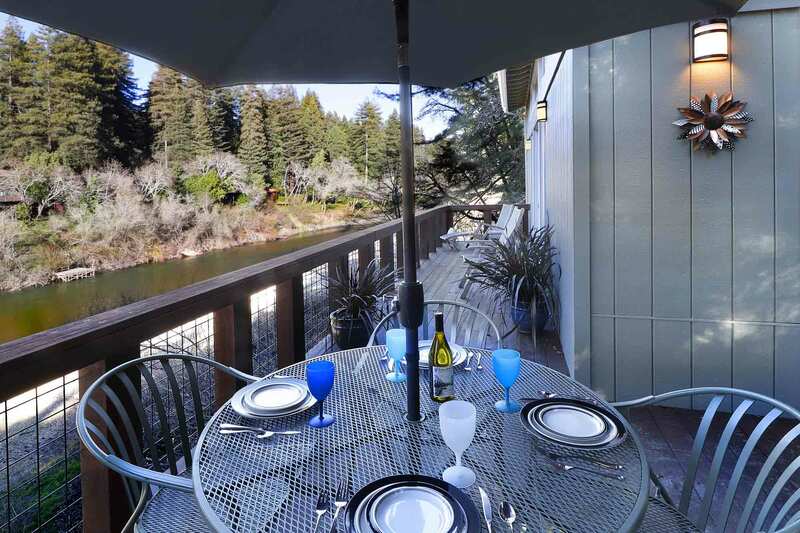 It has a beautiful view of the Russian river. I would highly recommend this property for families, couples or girls getaway! This was the perfect house for our family get together. "We were 5 adults & had a great time." Bella Vista was perfect for our family Thanksgiving. We were very comfortable & cozy. The views are beautiful & with the welcome rain, we felt content inside just having the river view. In addition, the hot tub was very nice! The bedrooms each have a private bathroom. Really, we have no complaints & would definitely stay here again. We were 5 adults & had a great time.
" Great spot right on the water." It is a great spot right on the water. We will definitely stay here again. "Great layout in a fantastic location." Beautiful home ,centrally located a few minutes from Guernville, well appointed kitchen, kayaks for the river, BBQ on the deck, great layout in a fantastic location overlooking the river. "Would come back any day!" What a beautiful home on a beautiful spot on the river. Would come back any day! 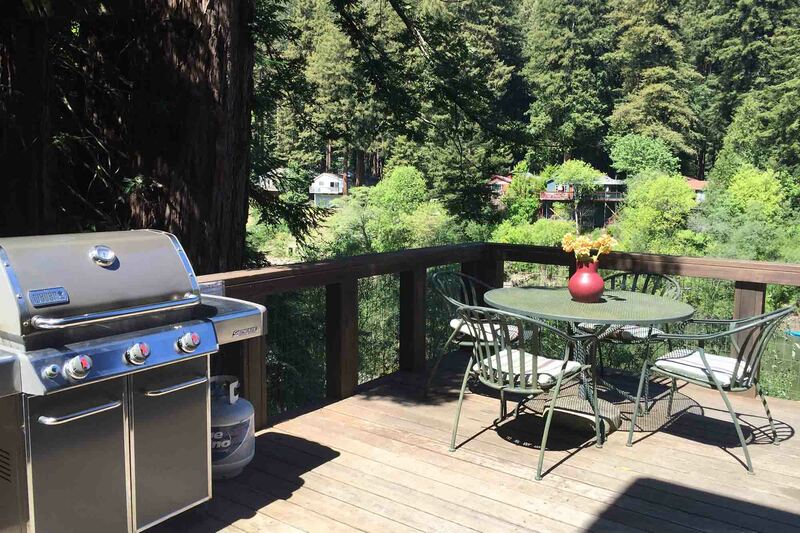 "Great place to enjoy Guerneville"
Amazing view!! Our family really enjoyed the floats and kayaks that were available, very comfortable home! Blow you away, you gotta stay here, I almost don’t want to tell you how amazing this location is because I don’t want it to always be booked up. You will love this location and enjoy the river and views. Thank you so much for your feedback Tim! We are so happy to hear you loved the loved this home! Great place right on the river. you can expect it to be clean and easy check-in and out. "This is a great house!" This place is wonderful!! 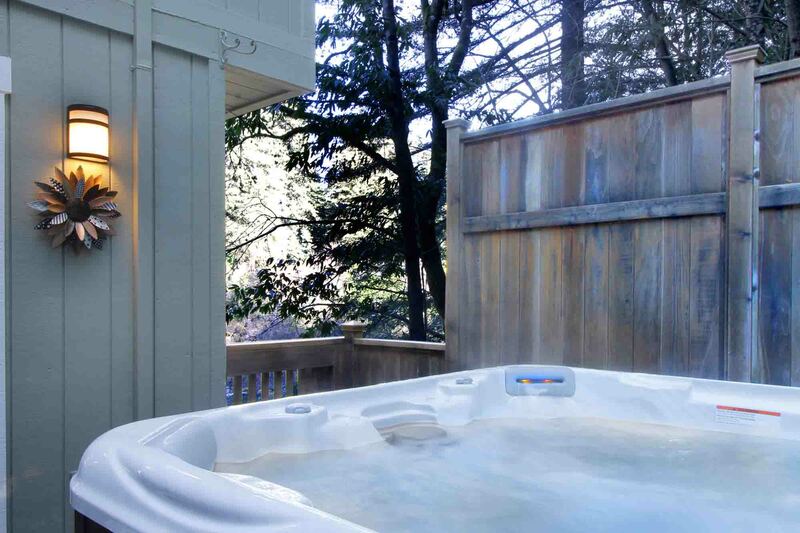 Right on the Russian River, with 4 kayaks and inner tubes to enjoy the water, and a hot tub to warm up in afterwards. This is a great house! "Terrific location and great river access"
Terrific location and great river access, really lovely place to relax and unwind! Unbelievable location. Right on the russian river, uncrowded and with beautiful redwoods on all sides. Loved kayaking and the attempts at catching a fish. The house itself was pretty comfortable, appreciated the complimentary bottle of Korbel. Its about 2 miles from Guerneville town, which has food/coffee and even a safeway open till late which was very convenient. Great rental. The view from the deck provides a serene, birds eye view of the river. River access with kayaks provided was an extra treat. House is well appointed and comfortable. Definitely would come back. We had 6 adults but house is probably better suited for 4 adult and 2 kids in the downstairs den. Very clean and nicely updated. A beautiful view. The bottle of champagne was a nice touch! Nice property in a great location. Very comfortable accommodations and well appointed. Loved the view and the hot tub! Thank you. 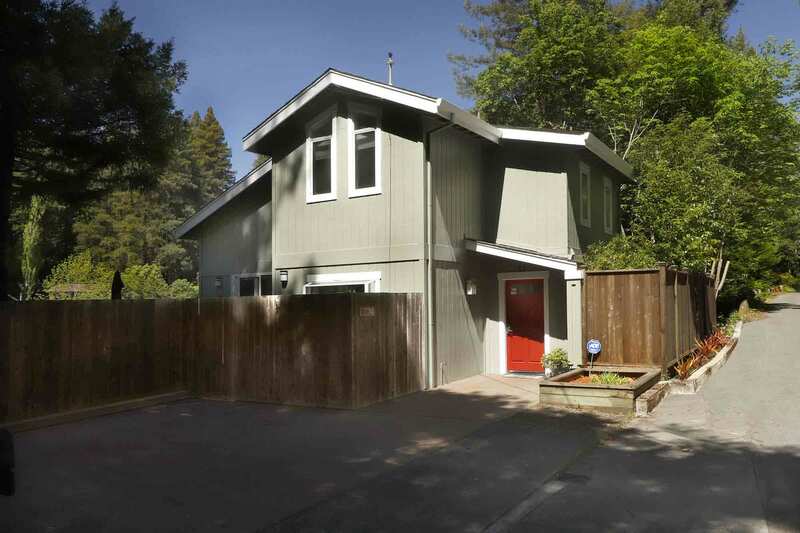 Comfortable, clean home with an AMAZING view of the Russian River! "We had a great long weekend"
We had a great long weekend. The house was spacious and nice. The deck was beautiful, with a great view of the river. The location was also great. Would recommend it. River Getaway's was very professional, we were well taken care of. "Spacious and Lovely Home - perfect for a family vacation in a beautiful setting!" We loved this home! It was immaculate and spacious. Its location along the river bank was so much fun. We were able to see egrets as they waded along the water's edge and could walk down to the riverbank from the home's deck. It comfortably slept the six of us, allowing space for both together time and alone time. Also loved the location. Easy drive to the beach or the redwoods. Thank you to our gracious hosts for allowing us to use your home! We’ve stayed in probably over 10 different homes the last four years and this hands down is the best. The place was warm without having to run a fire or a stove, the internet speed was great, tv channels were numerous, the kitchen was spacious and had everything we needed, the place was super comfortable, finding it was super easy, and the room we slept in was super spacious. I love this place. My only regret was we couldn’t stay longer! "Lovely and spacious house on the river"
This house is luxuriously cozy! They've thought of everything. We loved staying on the river but also enjoyed being so close to such a friendly town. I hope to book this gem again soon! "Lovely house in a lovely spot"
Kitchen is very well equipped. Our grandkids, 4 and 5 years old, loved the house and are already asking when we can go back. The beach just below the house is beautiful. 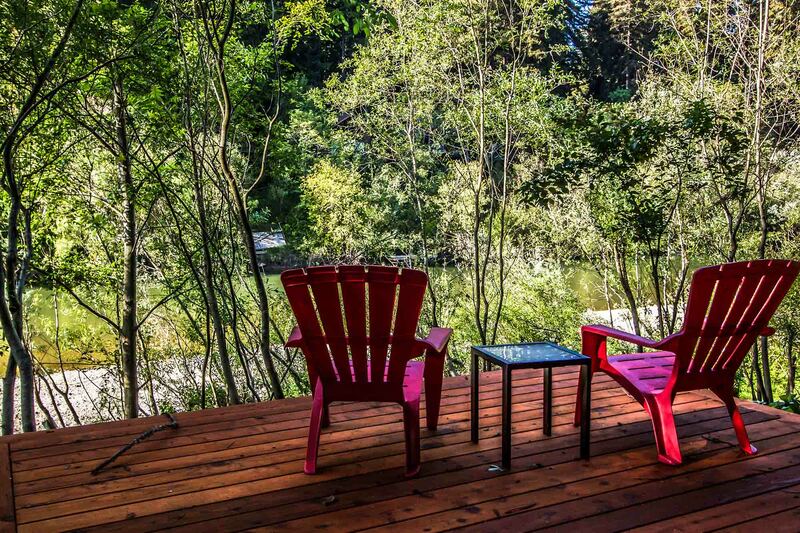 Charming downtown Guerneville is less than 5 minutes by car. Bella Vista is great. Recommend a visit when the River isn't up to 25 feet. Otherwise enjoyed our stay. 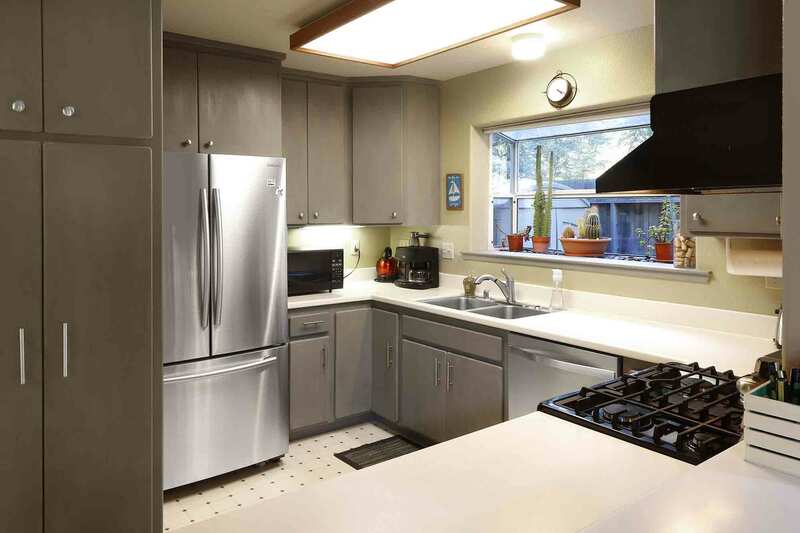 Nice home, tastefully furnished with comfortable beds, linens and fully equipped kitchen. The home was just as pictured on the website. Kayaking and swimming in the river was awesome. The house is about a 30 minute walk to town so we rented bicycles during our stay. I loved this house. It was a great location, perfect for our family of four and had all the amenities we needed to cook a full Thanksgiving feast in a peaceful autumn natural setting. We enjoyed the hot tub nightly, took drives to the beach in Jenner and anything we needed to pick up in town was super close. We also got to take our elementary age girls on their very first kayak trip on the russian river. I would absolutely like to return to experience the property in other seasons too. The views from the main living area and deck are just lovely. Thanks so much for your review. We're glad you enjoyed your stay at the fabulous Bella Vista, and it sounds as though you made the most of your visit. We hope you'll be back again soon! My family and I had a wonderful time at this beautiful house. Great location, deck overlooking the river...very peaceful and scenic. The house and kitchen were well stocked will all amenities you'd ever need. Thank you for a wonderful trip. You are welcome, and thank you for your visit and your review. Please do come back and stay with us again. "Fun weekend on the river!" Bella Vista was great! The house is well equipped with everything you need, well stocked kitchen for cooking, plenty of river toys, and comfy furniture and beds to make one feel right at home. The deck and private beach were amazing, spent 2 days hanging out and never left the place. Looking forward to our next visit which will definitely be longer. "Private, comfortable house for small family and dog"
We stayed at Bella Vista in October for just a three day weekend. The water was low so there was a large beach that we could exercise our dog on. My husband and daughter had fun using the kayaks.Bella Vista only has close neighbors on one side so the house feels very private, which is nice. The house itself is very comfortable and had (almost) everything we needed. (The kitchen could use a better sheet tray and larger cutting board for those of us who like cook. We appreciated the sharp knives.) We had a great time at Bella Vista, unfortunately dampened by finding out our house had been broken into. Sigh... We will have to try this little vacation again. 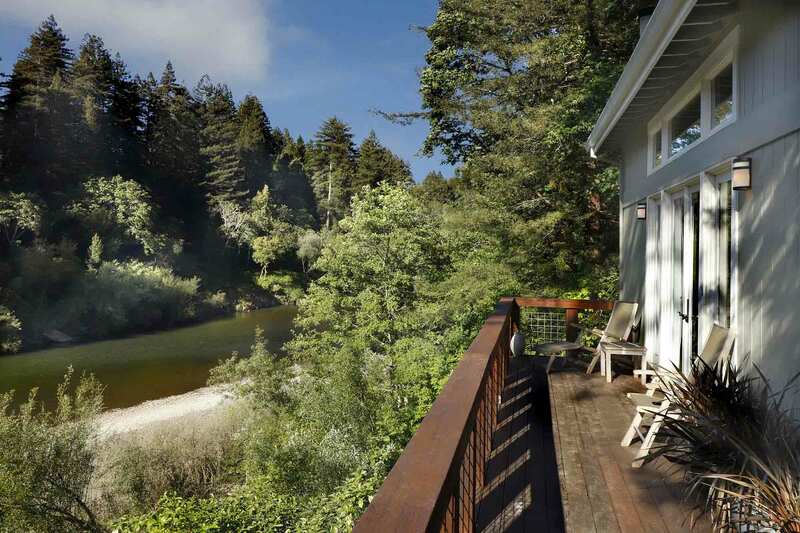 "Cute house with great view of the Russian River." The Russian River Getaways staff was very professional and helpful when we arrived and the door code didn't work. The problem was quickly resolved and we were ushered into this dreamy little house for a week of rest, relaxation and frivolity with all of the games, hottub, and river toys at our disposable. The house was clean, comfortable and cozy. The 2 master bedrooms upstairs and futon with its own bathroom downstairs was perfect for our family. The Welcoming Korbel Champagne was a wonderful surprise. Thank you! "Our family vacation was relaxing and peaceful." We had a great week at Bella Vista. The view of the river was fantastic. It was nice to have an access point to the river so we could hang out without ever getting in our car. The thing that stood out about the property was how well equipped it was. The kitchen had everything we needed. We ate every meal outside on the deck. We would definitely come back again. This was such a nice house, we felt so relaxed and happy there! They provided so many nice touches - like toys and board games for the kids, camp chairs for us to take down to the gravel beach, and a bottle of bubbly!!! Being on the deck among the redwoods was fantastic - we saw so many birds and wildlife! Being right on the river was definitely the way to go! We used the kayaks and canoe everyday.Location was very private, close to town but not walking distance. River was low because they had not yet put in the dams, but it was still fun.